ComeOn Casino - Read this review before registering! 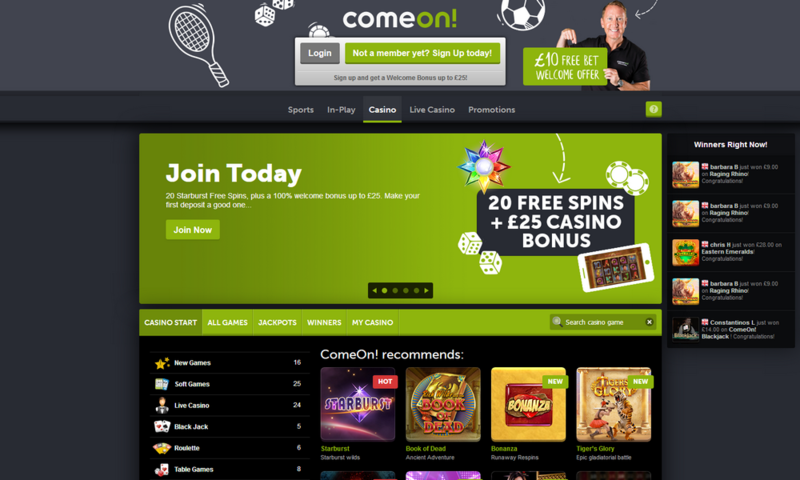 ComeOn is an established online casino that was first introduced in 2008. Since the casino has been around for almost 10 years, and they have proven their trustworthiness and many players regularly choose to play there. The casino is a multi-software casino that offers hundreds of games from many developers, among them the market leaders Playtech, Microgaming and Netent. You can also do sports betting when playing at ComeOn. The casino also offers many different promotions that regularly change and make playing there a lot more fun. They also have a loyalty program that rewards their loyal players. As a new player at ComeOn you can get a 100% bonus up to €25 that you can use for the casino or the sports book, or a combination of both. When you use the bonus for the sports book you will have to wager it 6 times the deposit plus the bonus with minimal odds of equal or greater than 2.0, and if you wager the bonus in the casino it is 35 times the deposit plus the bonus. The wagering requirements are relatively high, compared to other casinos, and we don't really recommend taking the welcome bonus at this casino. Also, keep in mind that deposits made with Skrill, Neteller, Paysafecard or Webmoney are excluded from the welcome bonus. The amount of the welcome bonus also depends on your currency, you can find the detailed terms on the website. ComeOn has many different promotions that may interest many different types of players. They offer deposit bonuses, special giveaway promotions, live game promotions and also free spins or free money promotions. If you get free spins the winnings are wager free and paid out as cash. The casino also has a loyalty program, that rewards players when they play, deposit or withdraw at the casino. At ComeOn casino you can find a huge game selection of over 700 games from different developers, such as Net Entertainment, Microgaming, Playtech, Play'n GO, Evolution Gaming, Yggdrasil, NoLimitCity, Quickspin, Betsoft, Williams Interactive, Nyx Gaming and Thunderkick. The games can be played directly in your browser and you don't have to download a casino software to access them. A huge selection of these games is also available for mobile devices, and you can play them on iOS or Android smartphones and tablet computers. The games are neatly organised on the website, and you can sort them either by category, by developer or by special game bundles. The slot selection includes some of the most popular games, among them Starburst, Reel Rush, Victorious, Flowers, Thunderstruck II, Immortal Romance, Avalon II, Mega Joker, Dead or Alive, Jackpot 6000, Jack Hammer, Excalibur, Game of Thrones, Gemix, Vikings Go Wild, and many more. You will definitely find a slot that you like in this huge selection. You could also try your luck at one of the many progressive jackpot slots. The casino also has a good selection of traditional casino games, and you can find Roulette, Blackjack or Video Poker games in many different versions. If you like to play against real dealers you can also find a live casino with Roulette, Blackjack, Ultimate Texas Hold'em, Wheel of Fortune, Baccarat or Three Card Poker. ComeOn has a licence from the Malta Gaming Authority, the UK Gambling Commission and the Curaçao Gaming Commission. The casino is regularly audited for compliance, and these strict licenses ensure that player funds are protected. The website is also secured through SSL encryption, and you can be certain that transactions are carried out in a safe environment, and that the casino will not disclose your personal information to unauthorised third parties. You have many different options available for deposits and withdrawals, and can choose from credit cards, e-wallets or voucher payments. The minimum deposit is €10, and the fees vary according to the deposited amount. Deposits with credit or debit cards below €250 incur a fee of 2.5% and are free when depositing more than €250, e-wallets and vouchers cost a 5% deposit fee. Withdrawals are usually processed within 24 hours, but also depending on the status of your account verification, they can be processed much quicker than that. It can take a few more days for the verification to be carried out by the casino when requesting a withdrawal from an unverified account that needs to be verified first. You get 4 free withdrawals within a 30-day cycle, any additional withdrawals will incur a fee of €5. The minimum withdrawal amount is €20. The support can be contacted through e-mail or live chat, but they are not available around the clock. You can contact the live chat between 10:00 and 22:00 CET and e-mails are answered every day between 09:00 and 22:30 CET. Unfortunately, the casino does not offer phone support. ComeOn as many aspects that make the casino attractive. The game selection is fantastic, but unfortunately the bonuses are not. Although you can use the welcome bonus for the sports book and/or the casino, the wagering requirements are very high when compared to other operators. Regarding the payments, it must be said that it is positive to note that you can get 4 free withdrawals in a 30-day period, but on the other hand the deposits incur a fee that varies depending on the payment method, and is more suitable for players who use credit cards and deposit larger amounts of money. Overall, the casino has some interesting features, but it is nothing special, and you can find other websites that are more user-friendly. Trust Flow is the average of all scores given by players. This means that it is you, the player, who gives the casino score. On the graph you can see the trend of this casino. If the curve goes upwards or stays linear is the casino good, but be careful if the curve goes downwards, as it means a lot of players are having problems at this casino. remove_circle What do you dislike ? add_circle What do you dislike ? I declare that my review is based on my own experience and represents my genuine opinion of this casino. I’m not a casino employee and have not been offered any incentive or payment by the casino to write this review. I understand that FeedBACK Casino has zero-tolerance policy on fake reviews.